The Turf-Truckster features a 2,850-pound payload and is available in a 32-horsepower (hp), electronic-fuel-injection gas model or a 26.1-hp diesel model. It is equipped with a with a dash-mounted shifter for manual four- or five-speed transmission models and is available with a three-speed automatic transmission. 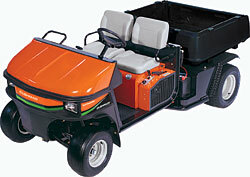 The vehicle has auxiliary hydraulics, and an optional high-output system is available. Managers can choose between steel or poly dumping beds.